The second night at Tanda Tula we were in for quite a surprise and adventure. Clinton, our fun-loving ranger told us that we were going to go on a night safari. First, we were to meet the happy-go-lucky always smiling bartender “Smiling” in the bar at promptly six o’clock where we were to pick out our preferred drink for cocktail hour in the midst of the wild. Yes, you heard it right. 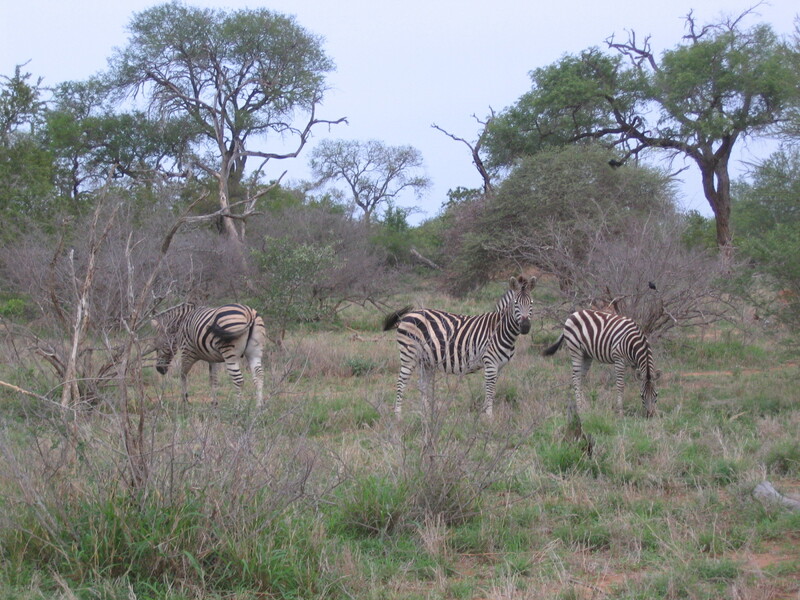 We were going to have happy hour right out in the middle of the game reserve! 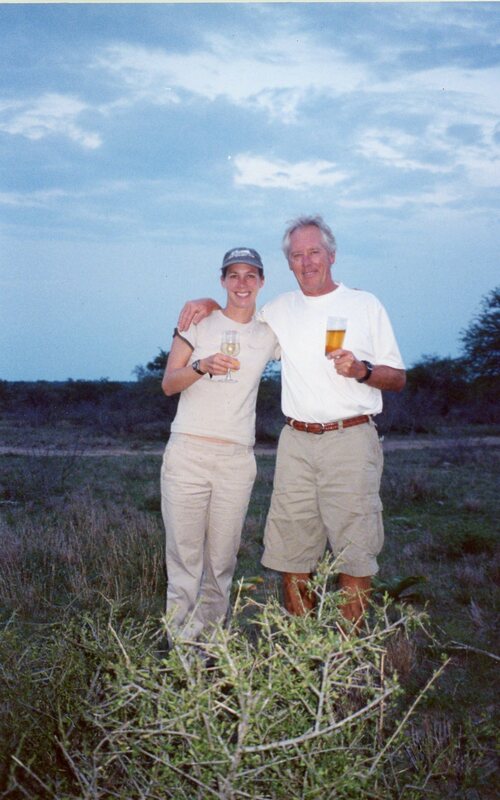 Next, we followed Clinton obediently to the bar, picked out our drinks which were loaded into an ice-cold cooler and placed aboard the land cruiser. Then we were off into the night filled with half-excitement half-fear. 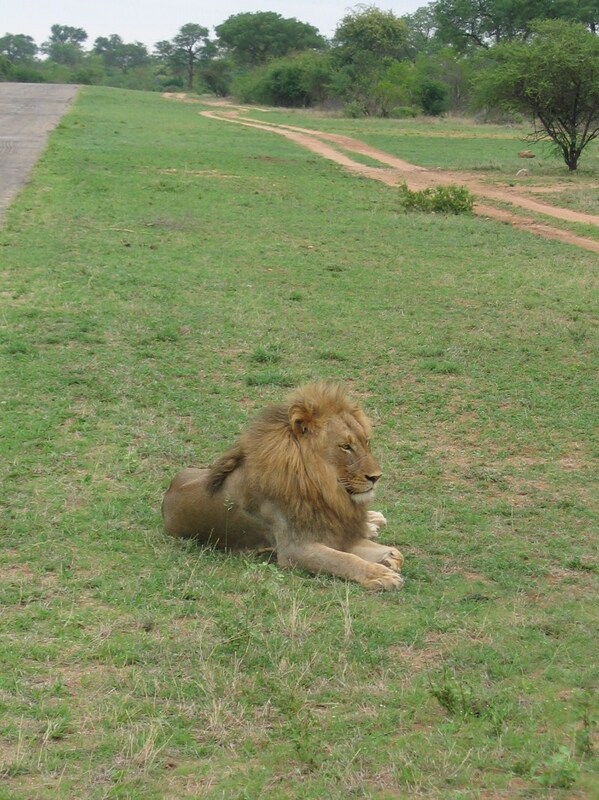 We followed the lions around for an hour, watching them pace and guard their environment. It was a pretty amazing experience! The next night, we were in for an even bigger surprise. 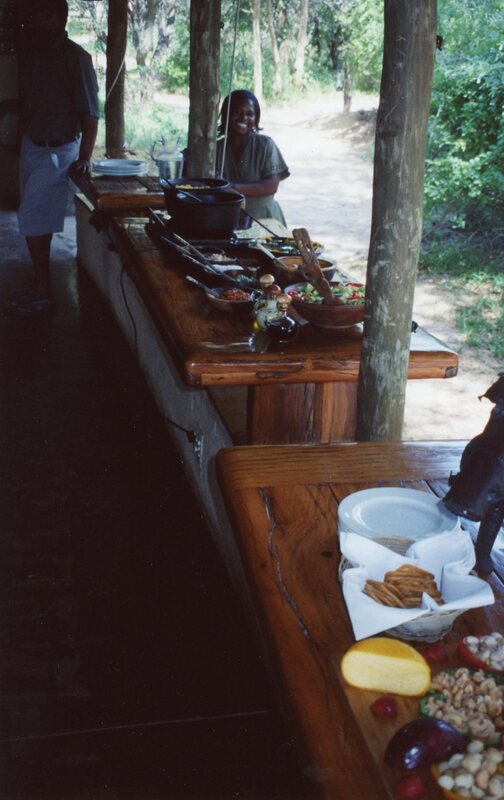 Around dinner time, we were all told to meet at the reception area and then instructed to board the land cruisers. Where were we going? I wondered. They didn’t ask for a drink preference this time so it wasn’t for happy hour nor did they mention that we were going on a night safari. Instead, it was total silence and suspense. 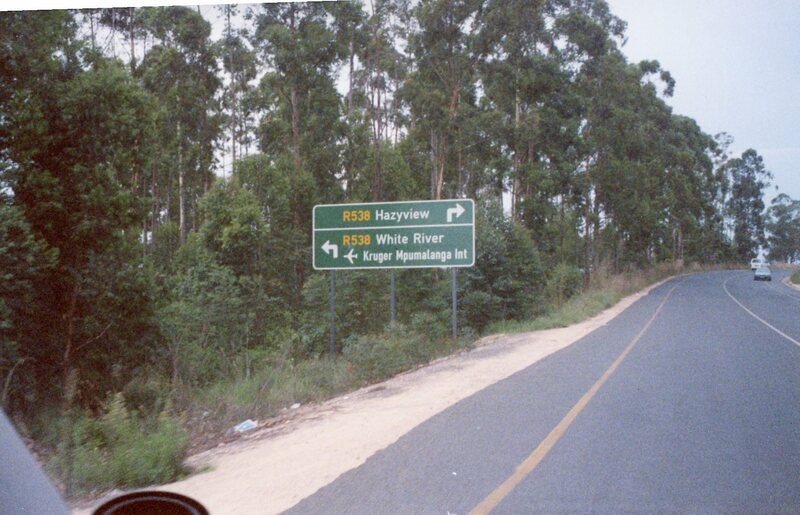 We drove into the thick of the game reserve, in pitch black darkness. Everything was still in the park. There were no animals. No noises. Just the sound of the land cruiser leading us somewhere into the dark night. Then, we saw it. A light. What was it? 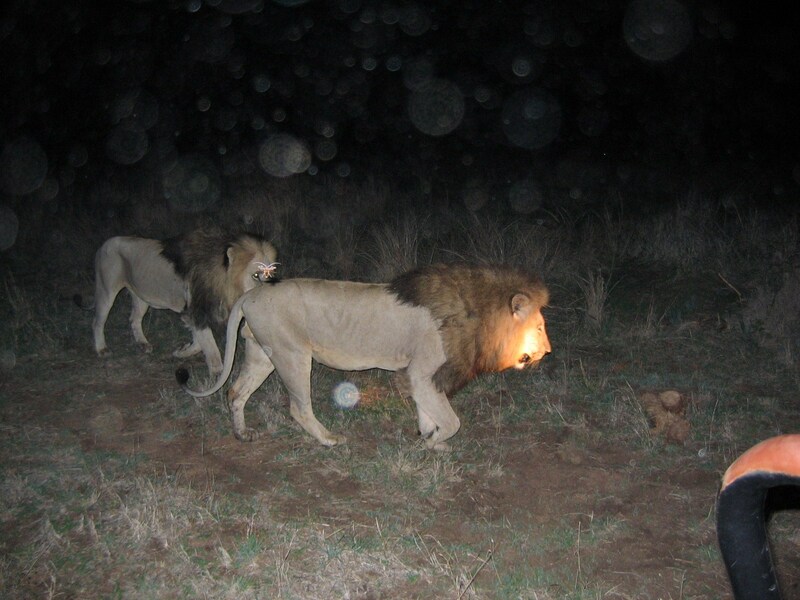 As we came closer, we realized the light was coming from a circle enclosure of torches. The flames of the fires spiralled peacefully in the light wind. 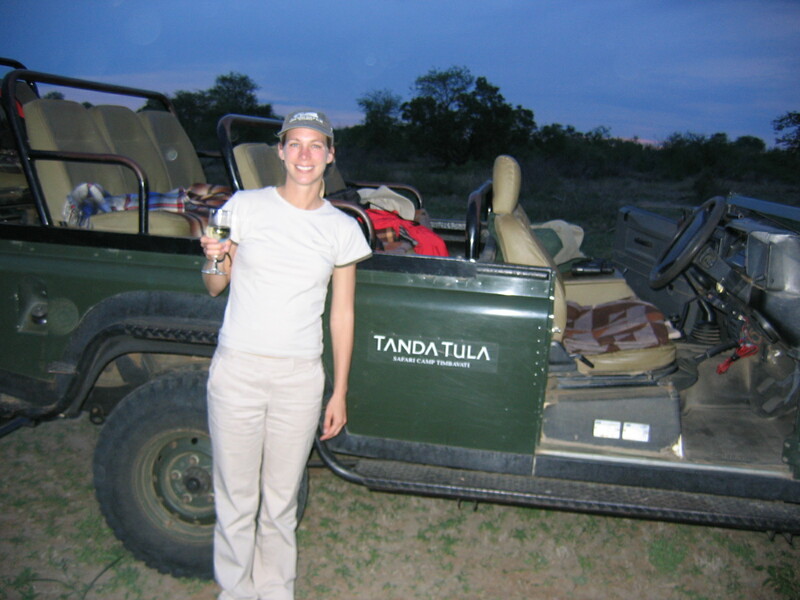 We got off the land cruiser, followed Clinton and were cheerfully greeted by the entire staff at Tanda Tula with a welcoming drink and an enormous bonfire. 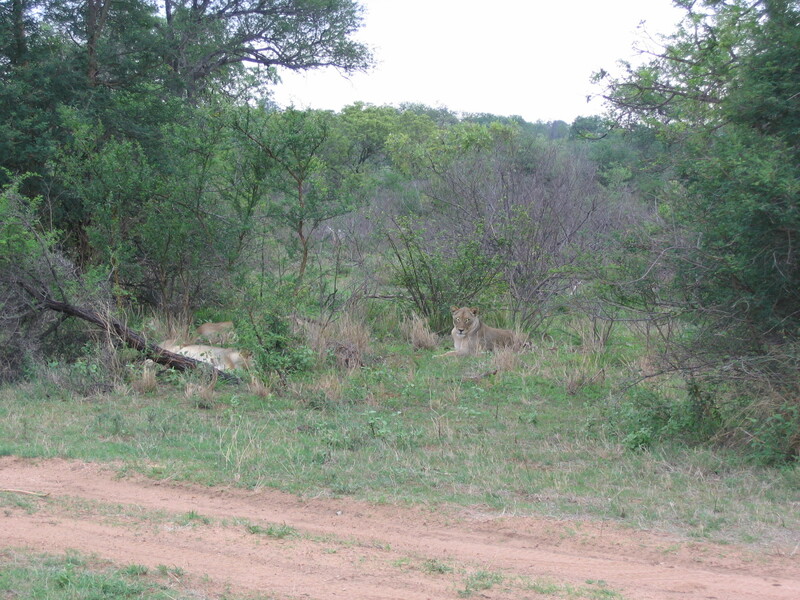 Then we saw it….the huge, long table for twenty placed strategically in the middle of the circle, next to the fire where we were going to have a feast of a lifetime smack in the middle of the game reserve! I couldn’t believe my eyes! What a spectacular surprise! We drank, dined and drank some more for over two hours, never once (well ok, maybe a few times) feeling the least bit concerned we would be attacked by wild animals or hungry lions who wanted to join the feast. There were armed guards at each corner of the makeshift camp, armed with tranquilizers just in case any animals decided to crash our party. It was a night I’ll never forget. It was an unbelievable experience! I woke up the next day with a headache so big I thought I’d been run over by a herd of elephants but it was worth every minute of the misery for a night of eating and drinking under the stars and into the wild! Stay tuned….My last post on South Africa will include a two-day visit to Jo’berg where we visited Soweto and saw a completely different side and perspective on South Africa. 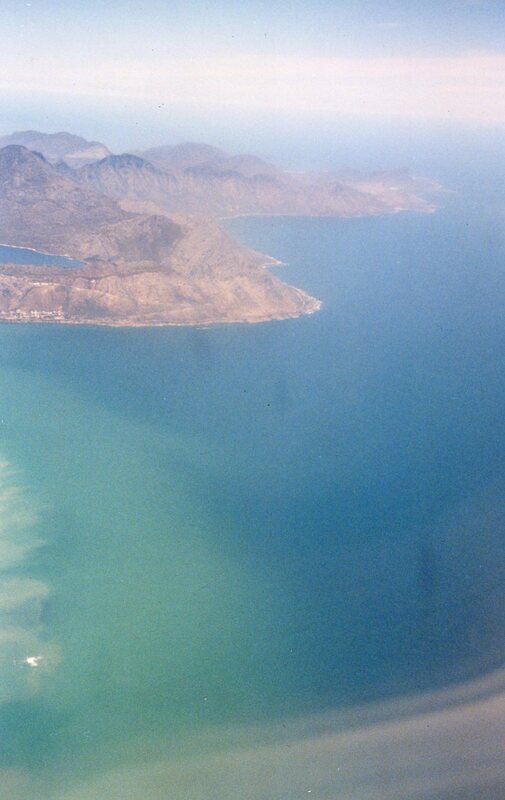 One of clear and total segregation. 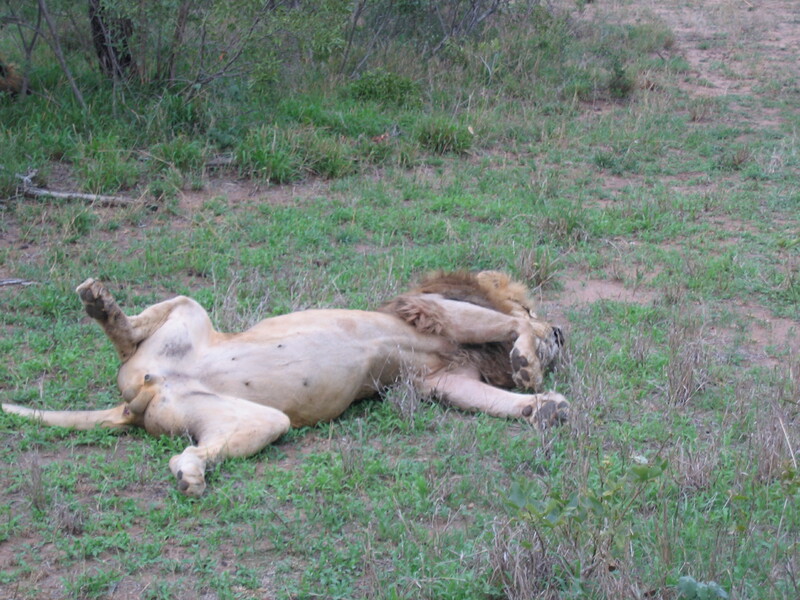 I awoke the next morning to the 5 AM call of the wild. The sun was barely up yet the jungle outside my tent was fully awake and alive. The monkeys were in their full glory, active as a toddler at a playground. I was exhausted but excited about the day that awaited. 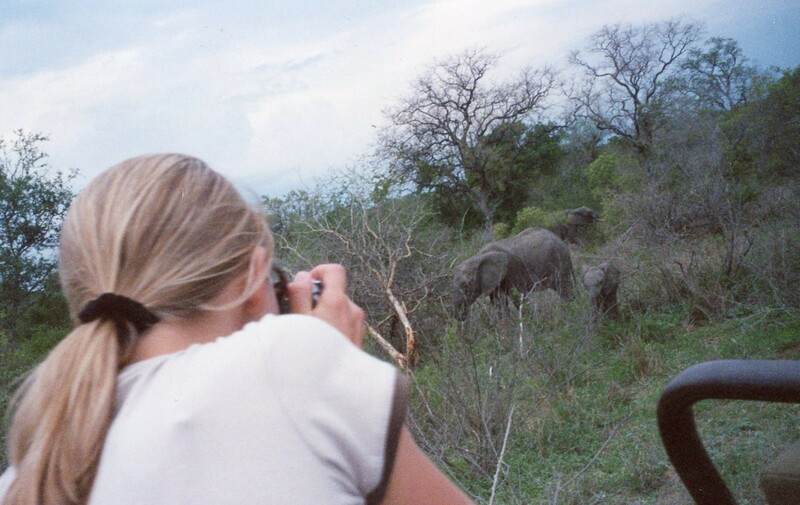 It was day one of my first safari and I could hardly wait. There was a slight tap on my door and I opened it to find Smiling, smiling as usual and holding a tray with a beautiful light breakfast of morning tea, fresh scones and fruit. I opted to eat on the verandah but of course I was forewarned not to leave my food for even a second. The swarms of monkeys playing jubilantly in the trees above would devour it all in a heartbeat. 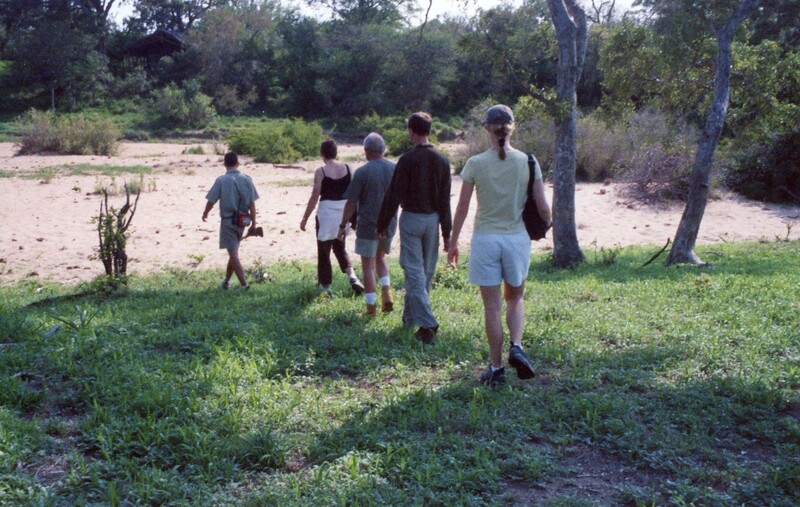 By 6 am, our group of six met at the main lodge and we boarded the open air land rover. 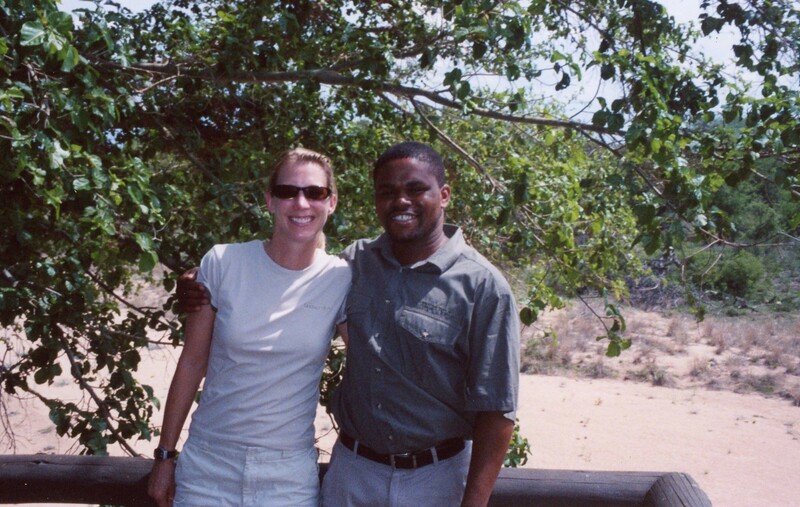 We had our ranger Clinton, a native African tracker and a driver on board as well. I could hardly contain my excitement and anticipation at finally after all these years actually going on a real live safari. I had to pinch myself to make sure it was really real. One of the lovely things about opting for a private reserve is the transportation. 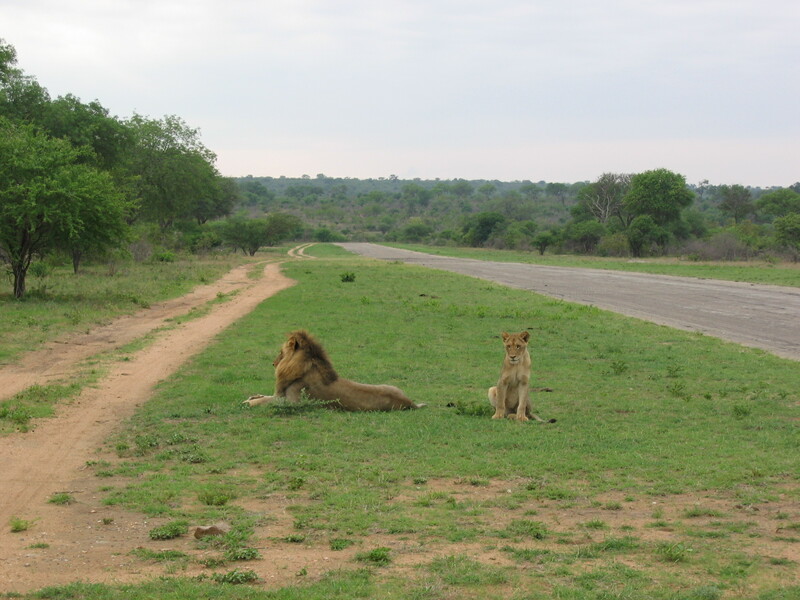 In public game reserves such as Kruger National Park, you must follow and stay on the roads in your car. 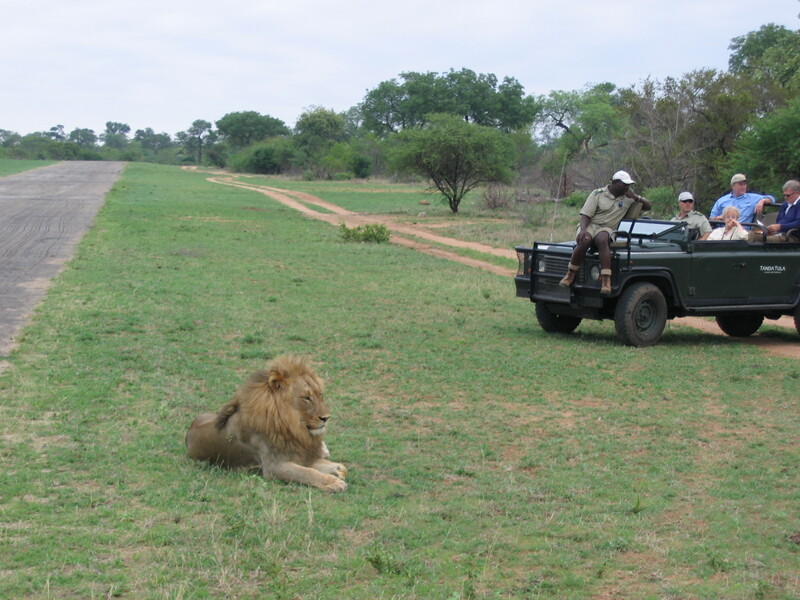 However, at a private game reserve you roam in an open-air, uncovered land cruiser and can go where ever you want, without having to stick to the roads! 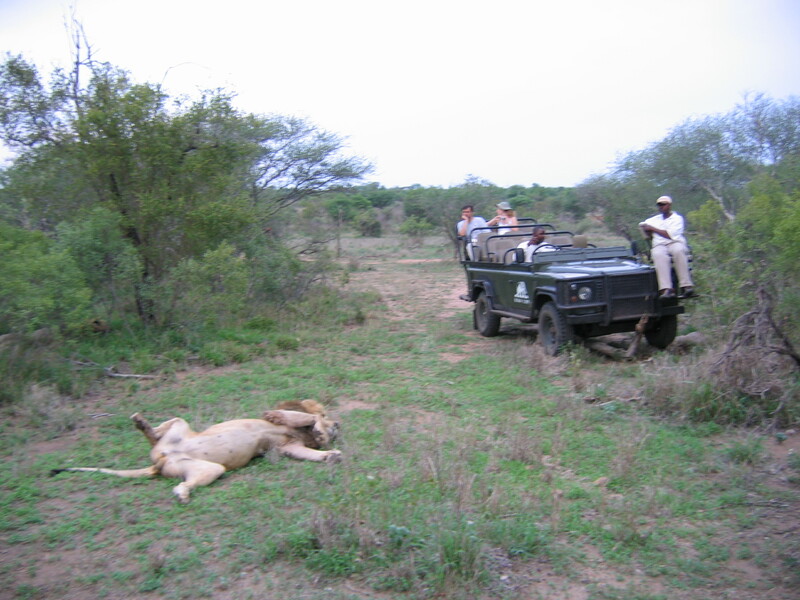 Here we are, setting off on our first safari drive with the animal tracker at the front and the ranger (with loaded gun just in case) on the right side, driving the vehicle. I was surprised how incredibly close we were able to get to the animals. It was quite a thrill and also a little intimidating to be sitting right next to an enormous elephant with no protection. According to our ranger, we were to remain motionless in the open-top rover. If we remained still, the animals would view us as a large mass and would not charge us or be afraid. In the event something went array, the ranger always carried a loaded gun with tranquilizers. 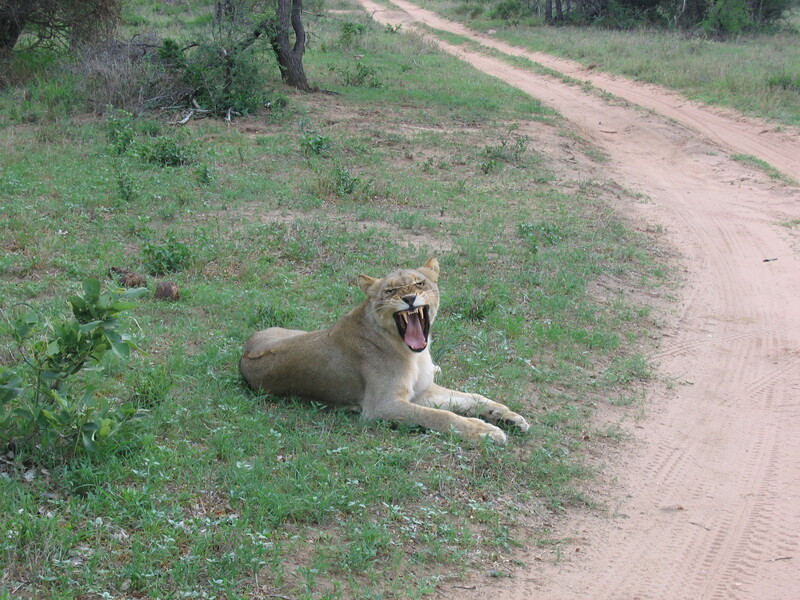 However, the animals although wild were used to having tourists come and basically ignored us. 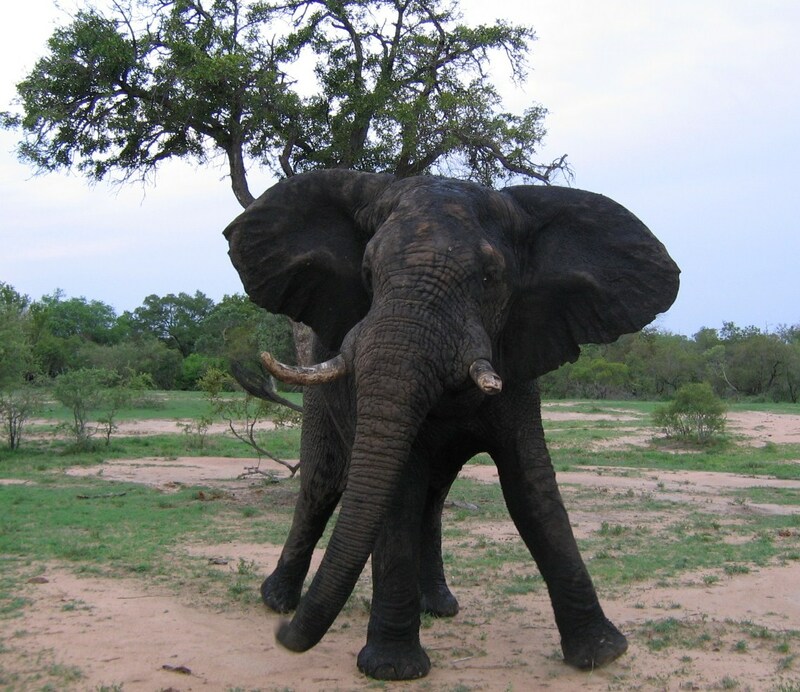 Here is another view of the mighty elephant. 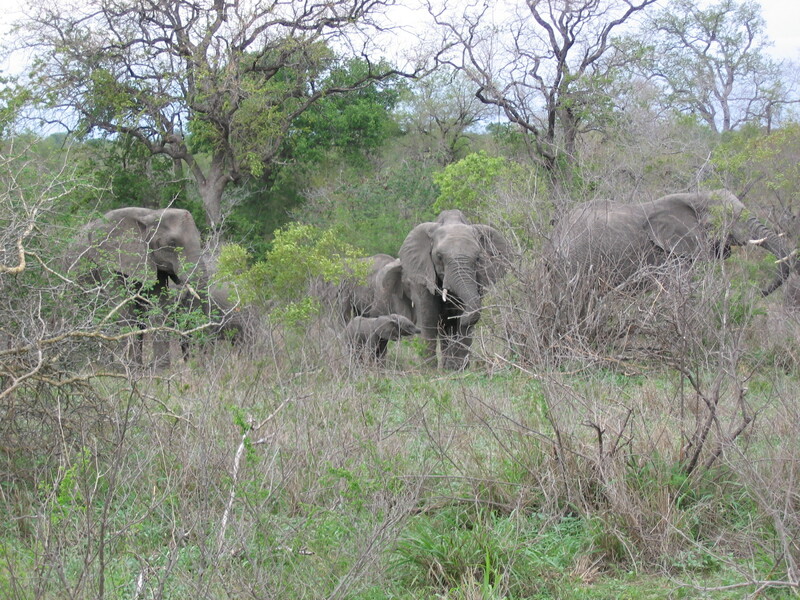 I could not get enough pictures of the elephants. I was completely enthralled by their majestic beauty and peacefulness. 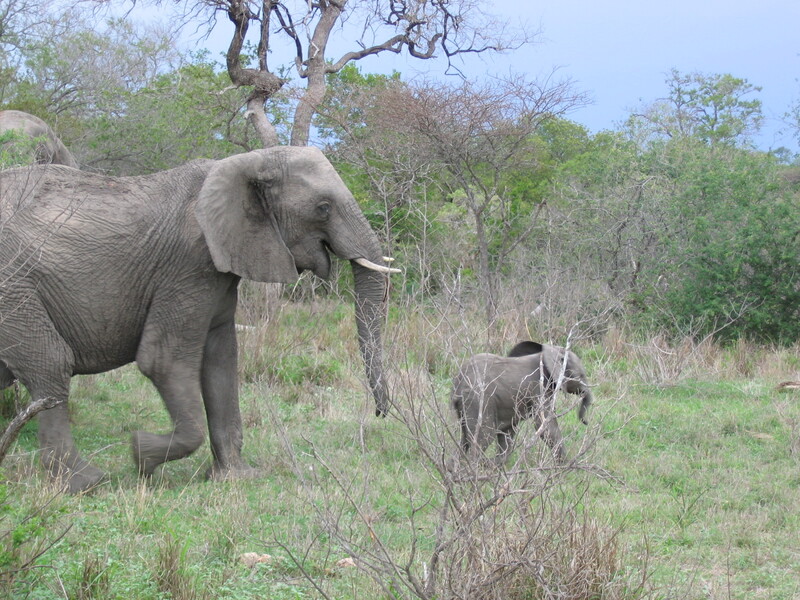 A lone elephant who at first was uninterested…. We spent some time chasing the elusive leopard and finally found him up in his favorite spot, a tree. Unfortunately once we approached he was gone before I was able to snap a photo. 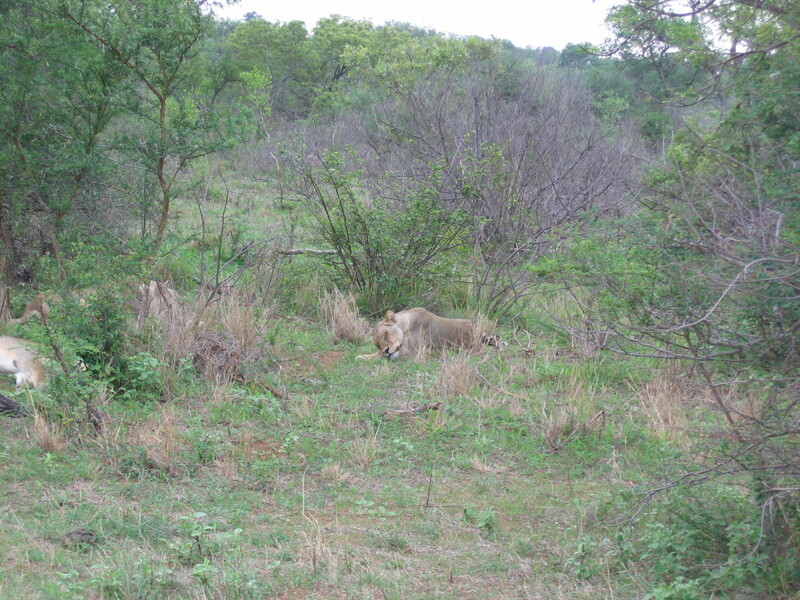 Then in the heart of the game reserve, we found the Lion King and the pride. By that point, I was getting used to being in an open-air vehicle but I was glad that the ranger was ready in case of any attack! Isn’t he cuddly and cute? He has such a beautiful mane! 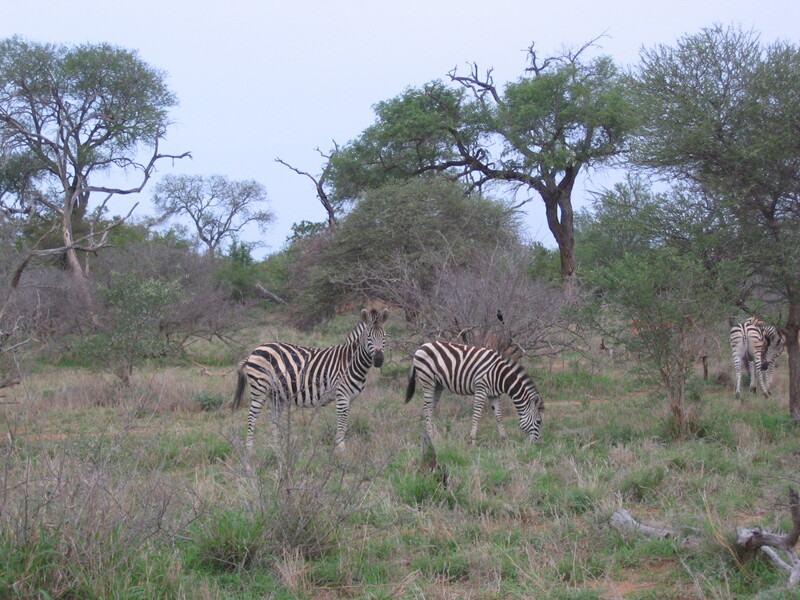 After all the excitement, we decided to get out in the middle of the game reserve and WALK BACK to our lodging…. 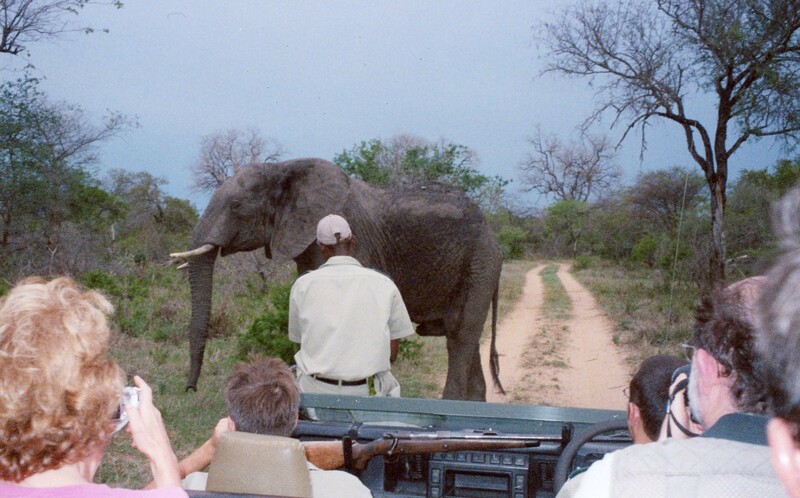 (Notice how Clinton, our ranger, had an armed gun just in case we were attacked by a herd of elephants or worse yet, a lion). My heart was beating like an African drum and I definitely didn’t want to be at the end of the line and first on the lunch list. I was thankful yet slightly disappointed we did not encounter any wild animals on our hour walk back! Phew!!! 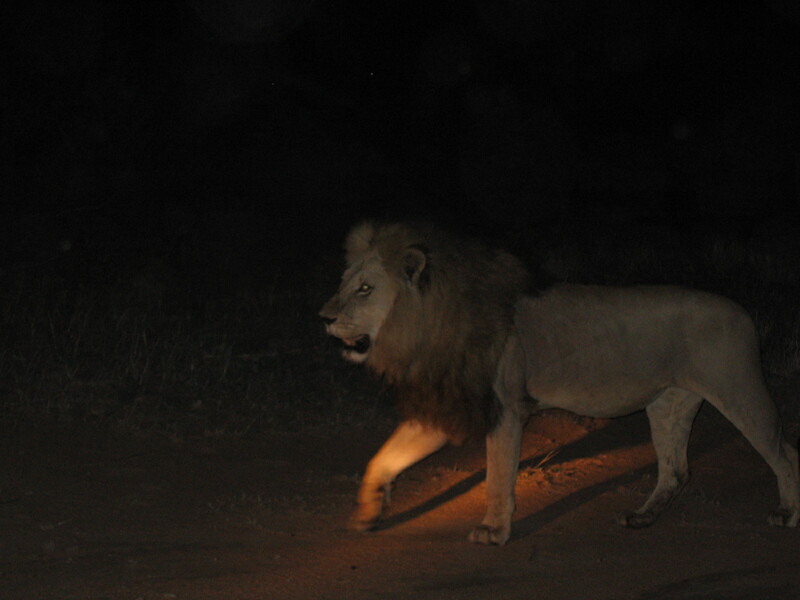 Stay tuned…next post will include our surprise night safari tracking the two dominant male lions, an outdoor feast in the middle of the park and cocktails au naturale! 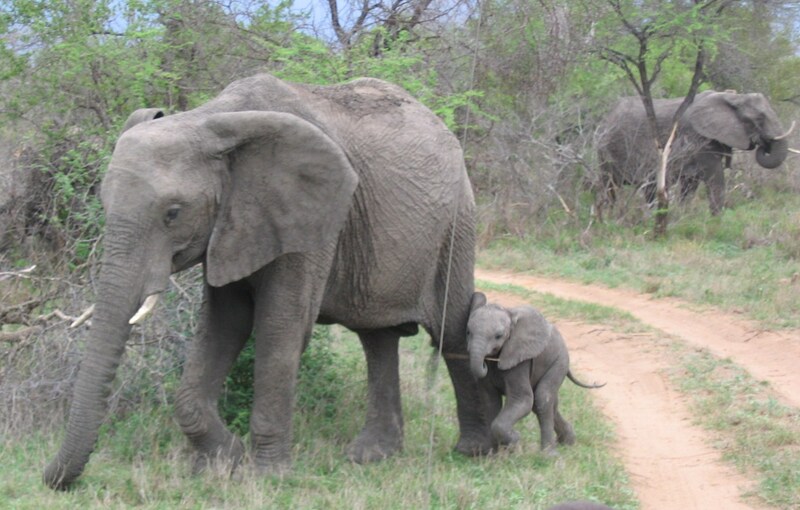 Our package deal from South African Airlines included a three-day stay and safari at the Tanda Tula Private Game Reserve located in the northeast section of South Africa adjacent to the world-famous Kruger National Park. 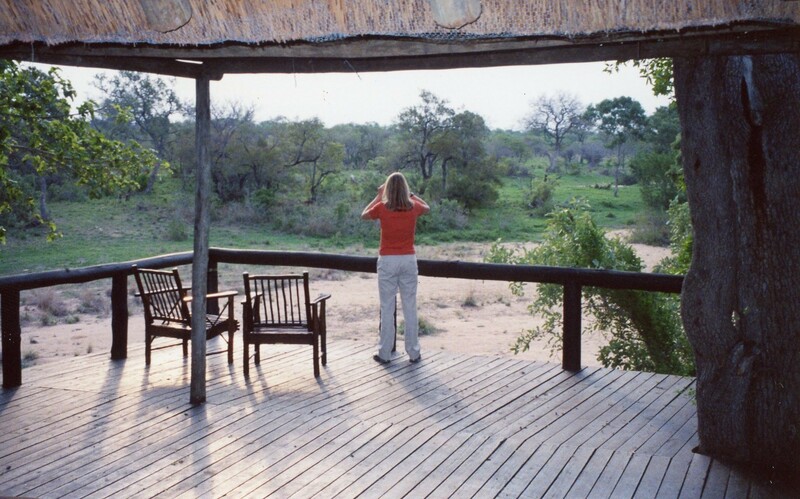 Tanda Tula was one of the first luxury private reserve camps established in the area and prides itself in giving the visitor beautifully appointed African safari styled “tents” in a gorgeous reserve with no boundaries and no fences. 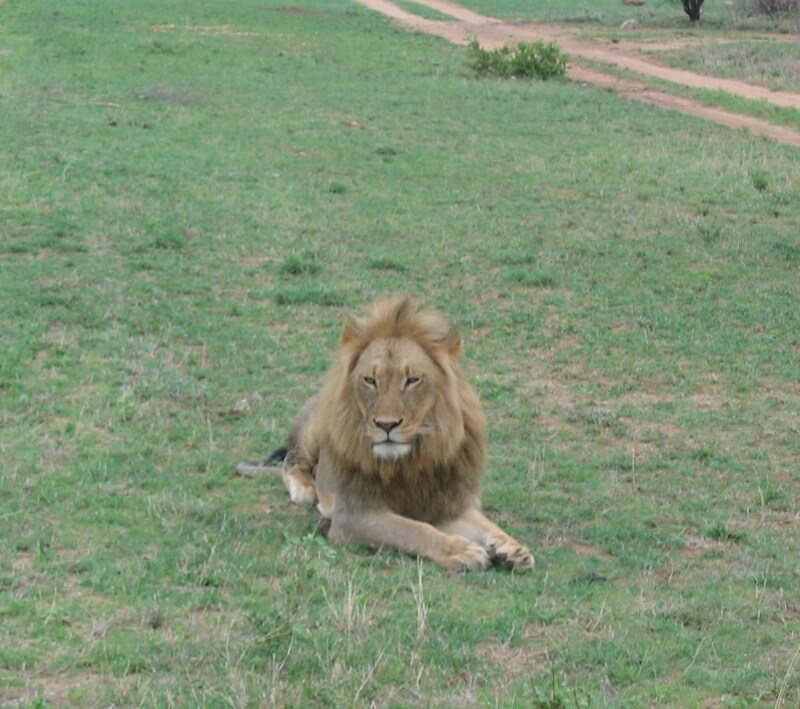 During our three-day stay at Tanda Tula, we would be going on an early morning safari ride, a late afternoon one and a surprise evening safari where we would be tracking the two dominant male lions in the reserve. We were also surprised with a candlelight dinner IN THE WILD….yes that is right. 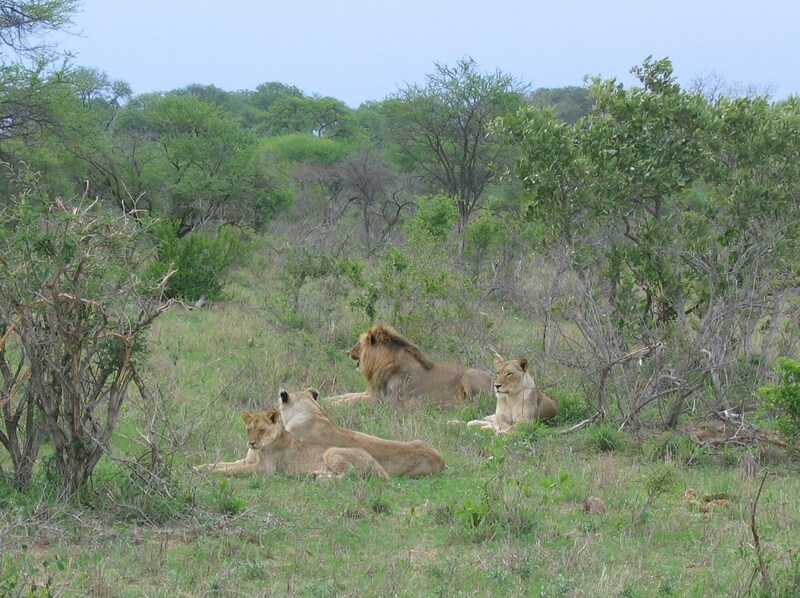 We ate an enormous feast right smack in the middle of the game reserve, while the rangers stood by on the watch. 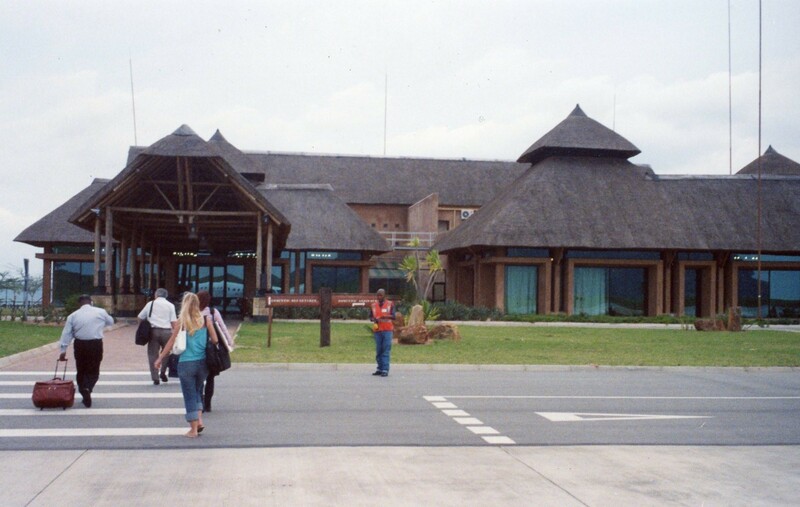 We took the morning flight out of Cape Town non-stop to Hoedspruit, one of three airports located near the Kruger National Park. Here are some photos of my first day into the wild. 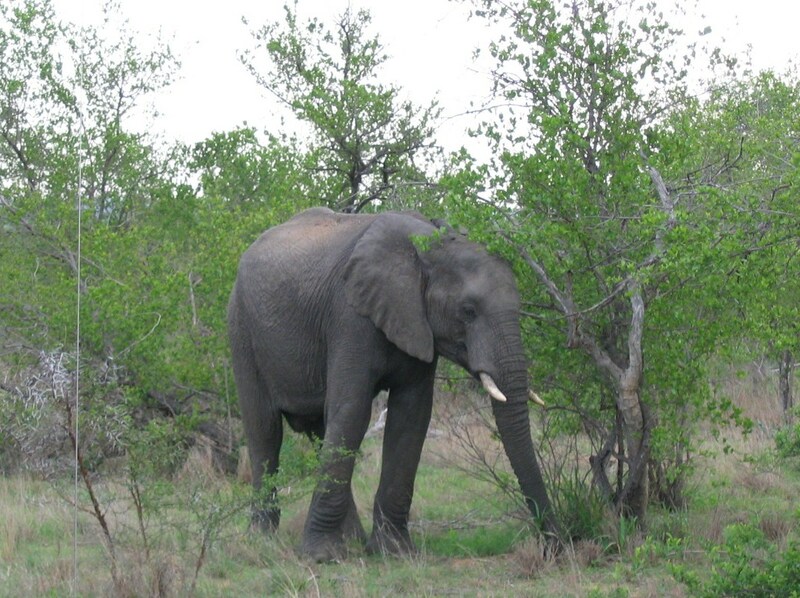 After collecting our luggage, we were met by our driver from Tanda Tula Private Game Reserve in the Timbavati Reserve adjacent to Kruger National Park. 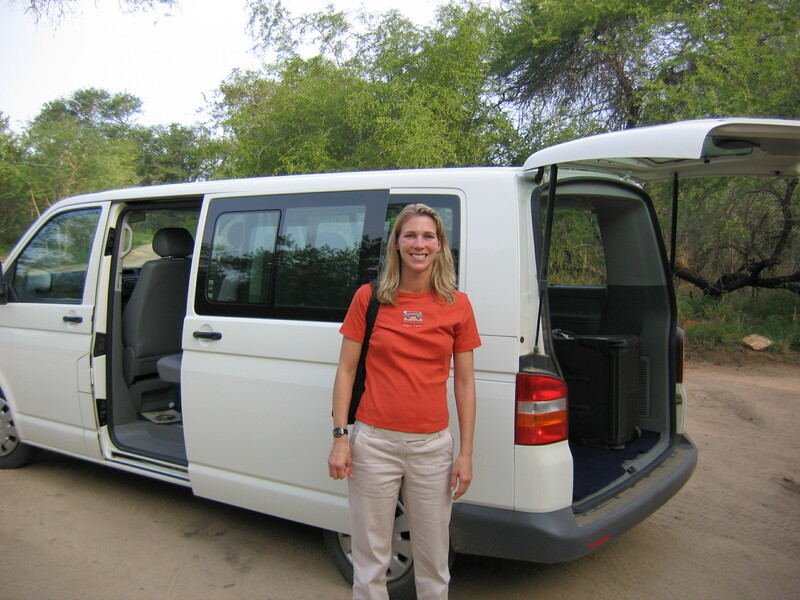 Our two-hour van ride was like nothing I’d ever experienced (at this point, I had not been to India or Nepal thus passing through the African villages felt like being on a movie set). There was village after village located right next to the roadway filled with Africans in traditional dress and women walking along the side of the street carrying their goods on their heads and children wrapped around them in brightly colored fabrics. Men and children were loaded into the backs of trucks and there was no sign of anything remotely modern. I desperately wanted to take some photos along the way but held back thinking that not the proper thing to do. Our van was the nicest vehicle for miles so getting out of the car to snap some photos would be extremely rude! 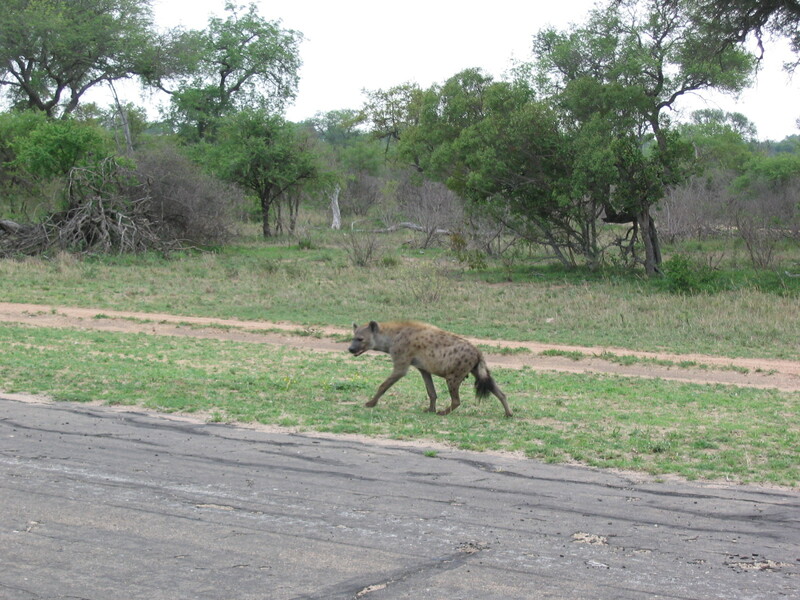 Checking out the surroundings….there are NO FENCES! Yes that is correct. 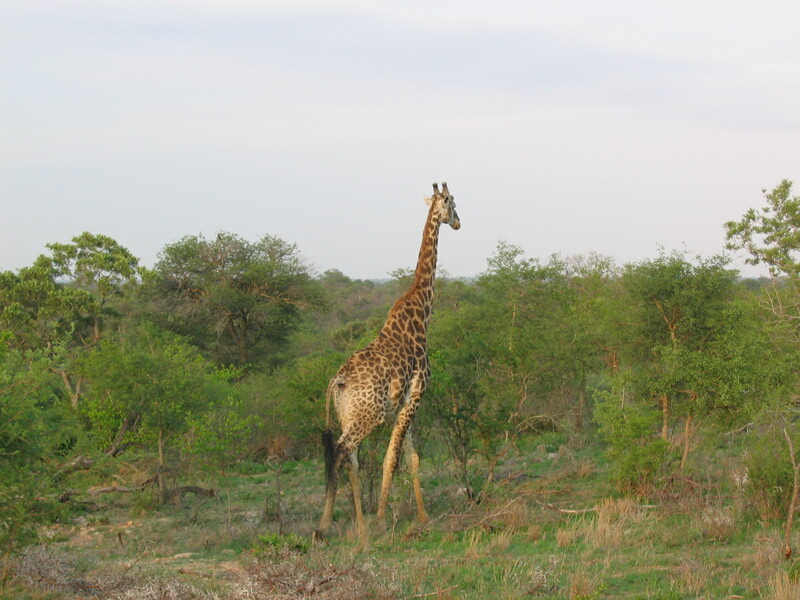 One of the beauties of visiting a private reserve is that you are literally in the wild. 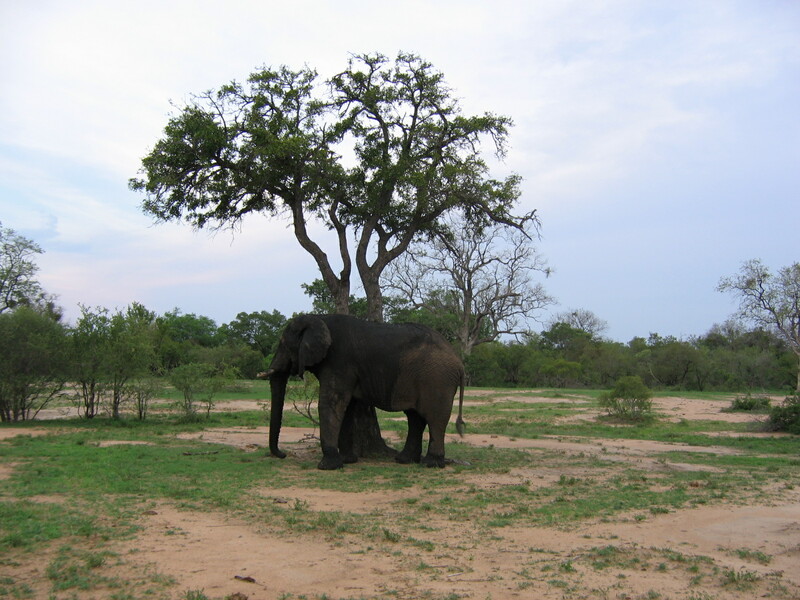 The entire base “camp” is without fences or boundaries meaning the animals are free to roam wherever they please. You must take extreme caution, especially at night. 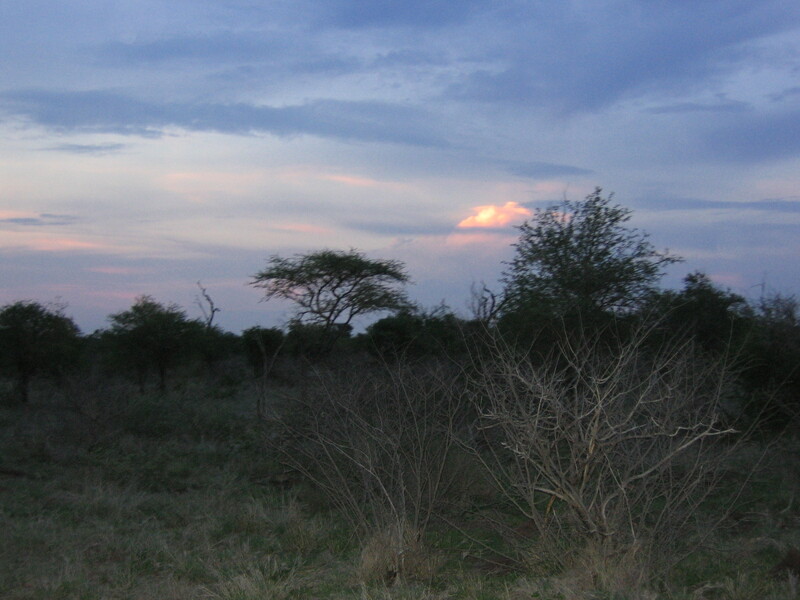 No one is allowed out of their tent once darkness hits as elephants, lions and leopards have been known to invade the campsite. 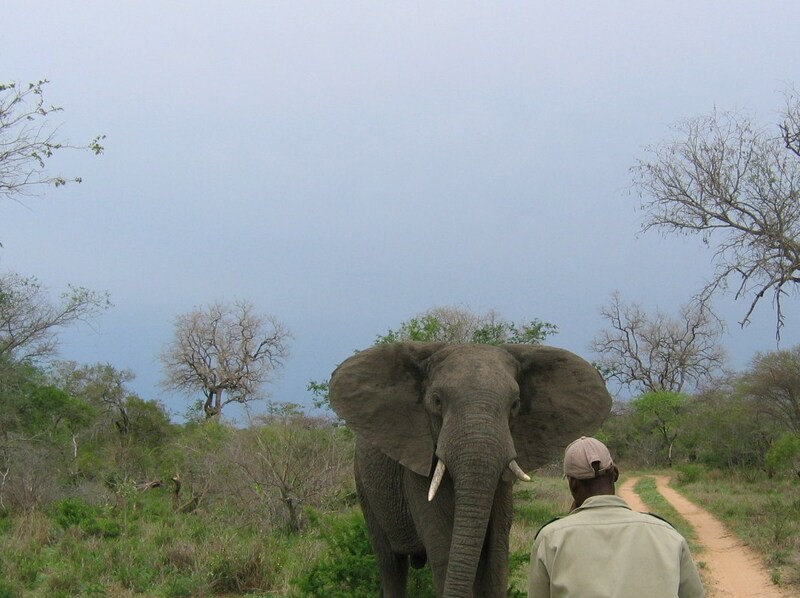 There is always a ranger on alert just in case a herd of 20-30 elephants decides to trample through your camp! 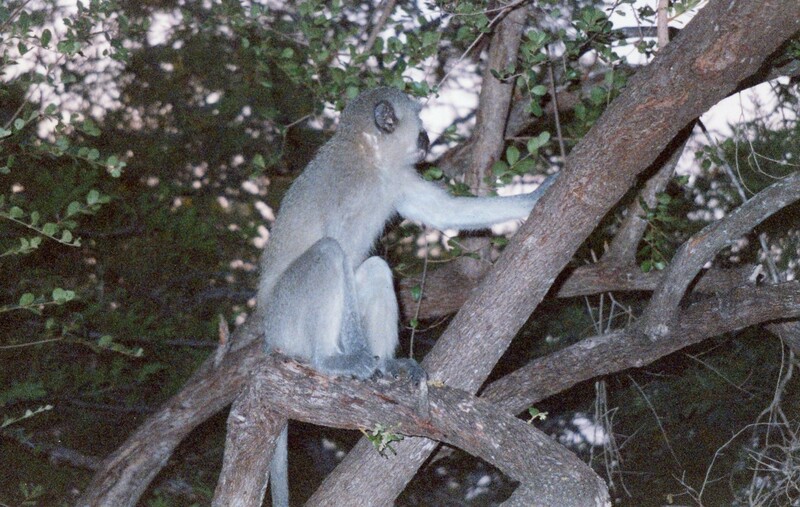 Here is a picture of the most annoying, yet charming friend….the neighboring monkeys that live in the trees surrounding the “tents”. You better watch your breakfast when eating on the outdoor verrandah….or it will be gone! Ok….drum roll please….here is a picture of our “tents”. Yep, these are our luxurious tents. There are eight in total and apparently they run for about $1000 a night if you were to show up and rent one. 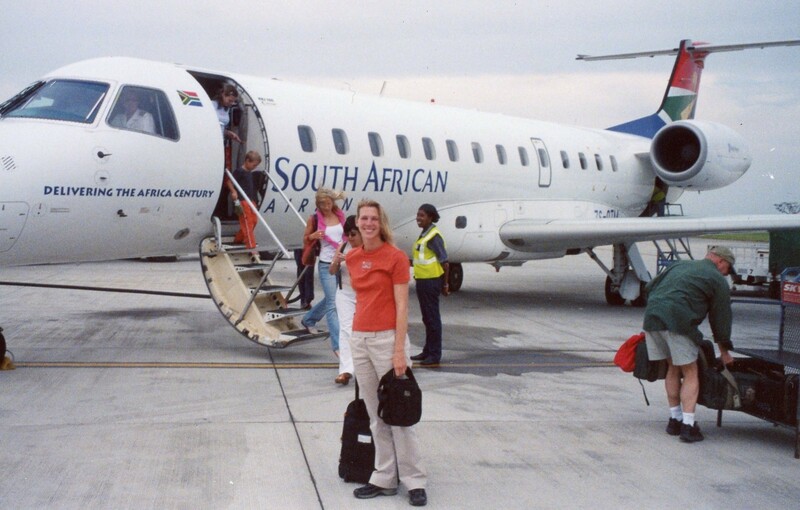 Our incredibly, amazing package deal from South African Airlines (remember $1800 for our Atlanta-Jo’berg flight, two other internal flights and lodging in three places including here!) must have really been getting a steal on this part of the deal. 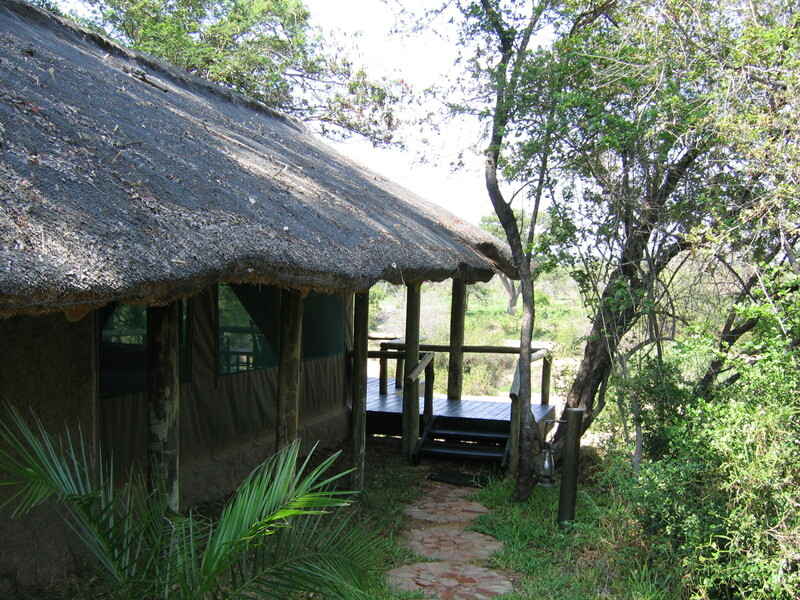 When we arrived at Tanda Tula and checked in, my dad mentioned that I was his daughter, not his wife (they had us originally in one “tent” and it only has one bed, not two like we requested), their simple response was “no worries” you can stay in the tent next door at no charge. Can you believe it? I got a $1000/night tent for free! Wow!!!!! The inside view. Note the minimalistic structure. It is sturdy yet not too enclosed so there is no avoiding the sounds of the wild. My first night sleeping alone was a little scary as I would jump at every noise and it took me awhile to finally fall asleep to the bizarre, dramatic sounds of the wild. 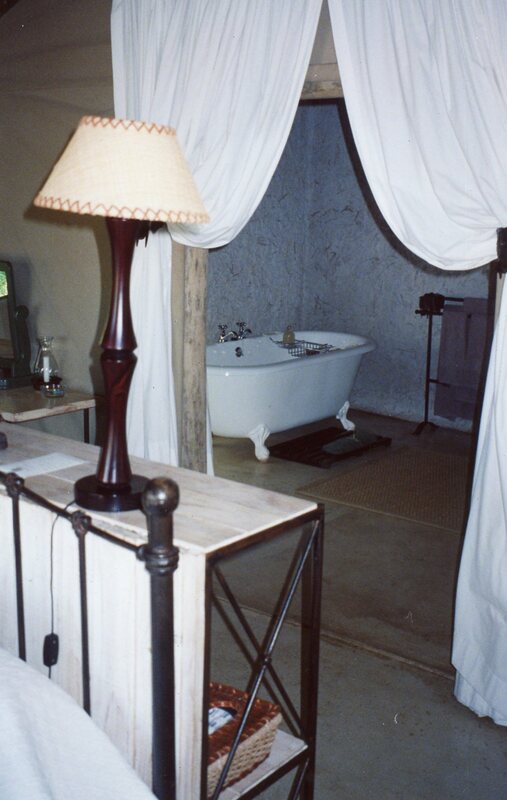 Plus your own private bath tub and bathroom which includes an OUTDOOR shower, right in the thick of things. It felt a little strange actually taking a shower that first night as dusk settled in and the animals began to make noise. Plus there were more bugs than I’d ever seen but this was so cool! 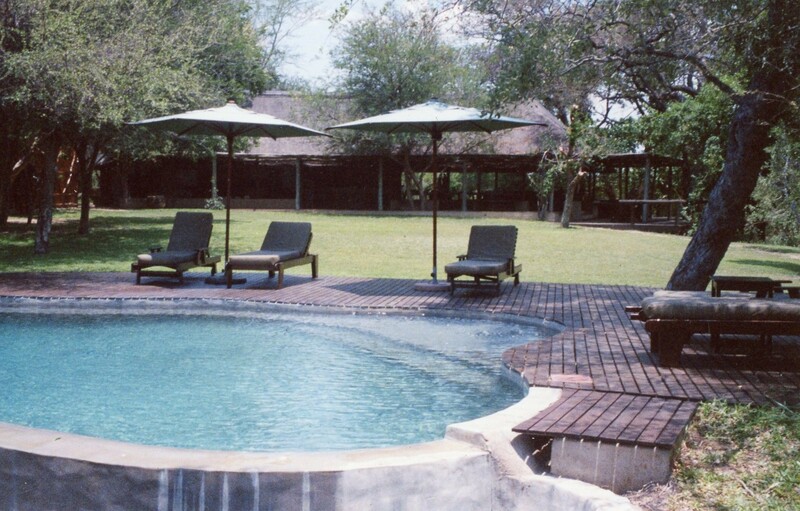 Tanda Tula has beautiful, lush grounds and even a pool in case you are interested in taking a dip (it gets quite hot there in the afternoon). 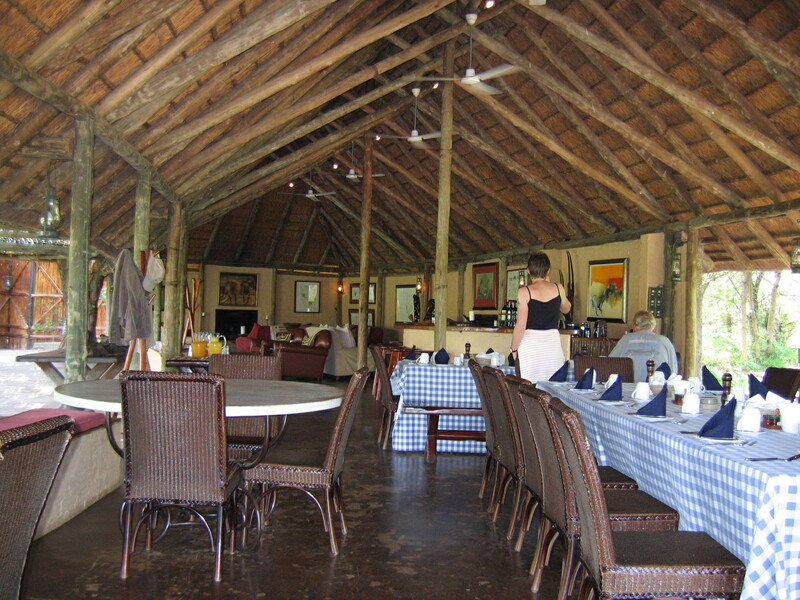 Every meal is prepared from scratch and contains a delightful selection of South Africa’s finest. 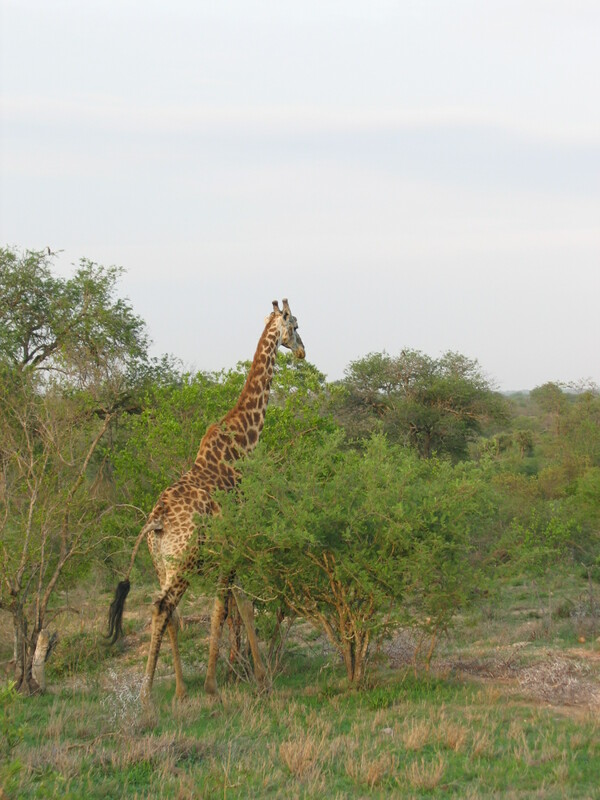 Our meals were eaten on the large, open-air dining hall which afforded views of the game reserve and if lucky, a curious giraffe or two. Me and the friendly bartender, known as “smiling” because he ALWAYS smiles! 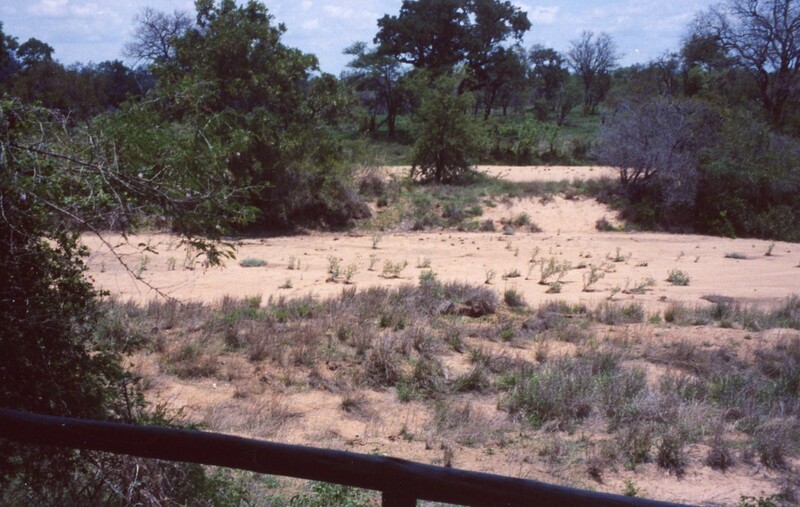 View from the open-air verandah into THE WILD….. I wondered what on earth was out there? 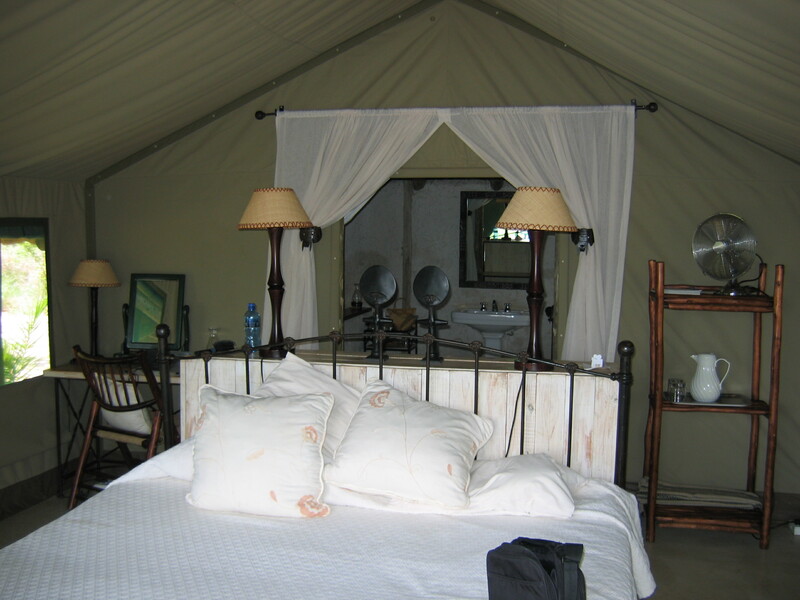 Would it come near the camp or even scarier, my tent while I am alone, tucked away under the luxurious white covers? Those thoughts swirled around my head as I turned off the lights, closed my eyes and listened to the call of the wild. Nature at it’s finest.